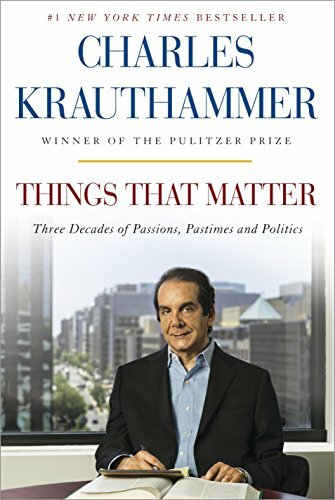 In this Amazon One-to-One, Charles Krauthammer and Dana Perino discuss Dr. Krauthammer’s new book Things That Matter: Three Decades of Passions, Pastimes, and Politics. 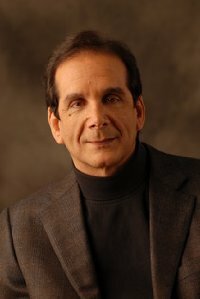 Charles Krauthammer is a Pulitzer Prize-winning syndicated columnist, political commentator and physician. Dana Perino is a Former White House Press Secretary who worked with President George W. Bush, contributor and co-host of The Five on FOX News. She is a long-time friend and fan of Charles Krauthammer. Dana Perino: Your new book covers three decades of your writings, divided into 16 chapters, and grouped into categories of the things that have mattered to you in your life. As you reviewed your body of work, were you surprised by anything that you had written? Did you ever think, “I can’t believe I ever thought that”? Charles Krauthammer: No real surprises—I find that I agree with myself a lot—except for my enthusiastic review of Independence Day. Though I might've been unduly swayed by seeing the premiere with my son, then ten, who announced after the showing that he would see the movie every week for the rest of his life. DP: The thing that has mattered most to you is your family. Your book opens with a column that could be called “a two-hankie job.” How hard is it to write about the people that you love, to give people a glimpse into your personal life? CK: I didn’t become a writer to write about myself. In fact, I don't even like using the word "I" in writing an opinion column, let alone a personal one. The only times I really have written about my own life is when it had a purpose outside myself, such as honoring a person, perhaps a friend or mentor, of extraordinary character. DP: As a long-time fan of yours, there are some of your columns that I remember reading, and where I was when I read it, and how I said to my husband, “That’s exactly what I was thinking!” Do you know when a column is going to be a hit? CK: Quite the opposite. I'm always amazed how wrong I am. A column that I think will sink like a stone might catch on like wildfire. Others that I'm proud and smug about as I submit for publication, leave no trace. Which is why I'm a writer, not a publisher. I wasn't made for marketing. DP: The original essay you penned for Things That Matter is like an award-winning exhibit of your heart and mind. What will readers learn about you that they may not have known? CK: How improbable my life story is. I still wake up simply amazed how I've ended up where I am, mostly by serendipity and sheer blind luck. I started out as a doctor. I ended as a writer. And that's the least of the stunning twists and turns that have defined my life—which I write about, for the first time, in the introductory essay to Things That Matter. DP: You have become a must-read and a must-see on television news programs. Parents shush their children when you’re about to speak. On the rare Friday when you don’t have a column or when you’re not on Special Report with Bret Baier, your mom gets calls of “Where is Charles?” Disappointment hangs heavy over your fans. But who are your weekly must-reads? CK: George Will. David Brooks. Mickey Kaus. And for that happy half of every year—April through October—the (daily) box score of the Washington Nationals. DP: Do you think that your training as a psychiatrist has given you an advantage when observing people in politics? CK: Actually, no. Psychiatry has everything to say about mental illness, very little to say about ordinary life. It offers no magical formulas for understanding human behavior beyond what any lay person can see. Although I do like to joke that there's not much difference in what I do today as a political analyst in Washington from what I used to do as a psychiatrist in Boston—in both lines of work, I deal every day with people who suffer from paranoia and delusions of grandeur. The only difference is that the paranoids in Washington have access to nuclear weapons. DP: You wrote a column on September 12, 2001 that is included in Things That Matter. How difficult was that to write under the time pressure of the day, and to keep your commentary to standard column length? CK: Like the whole country, I was on fire with fury. I felt I simply had to write. The difficulty was less time pressure than emotional pressure—trying to suppress my feelings so I could be as analytical as possible. Sometimes that kind of writing can be disastrous. I think this one came out right. DP: Given the mention in your essay, and because I have a gut feeling that we’re on the same page, what is your preferred style on serial commas? CK: With commas the rule should always be: the fewer the better. They are a scourge, a pestilence upon the land. They must be given no quarter. When you list three things, it should be written: a, b and c. If you see a comma after the "b"—call 911 immediately. DP: Many readers may not realize that you once were a Democrat? Was it a gradual or a spectacular breakup? CK: Like most breakups, gradual. Like few breakups, however, without regret. DP: You have covered politics and government since the Carter administration. Do you believe that America’s politics are too strained, too partisan, and too deranged to make meaningful progress? CK: Not at all. What we need is not a new politics but a new president. DP: What do you think will be the things that matter 20–30 years from now? CK: The things that really matter, as I try to explain in the introductory essay—the cosmic questions of origins and meaning, the great achievements of science and art, the great mysteries of creation and consciousness—shall always be with us. Thirty years from now, 300 years from now. I hope that one contribution of this book will be to provide some illumination on these wondrous mysteries and achievements. DP: If you had a magic wand and could get the U.S. federal government to do three things, what would be your top priorities? CK: Abolish the income tax code with its staggeringly intrusive and impenetrable provisions and replace it with a clean consumption tax. Get out of the race business and return the country to the colorblind vision of Martin Luther King.